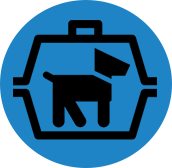 The average pet travel charge is $40 and they are treated with the same quality in customer care as you are. However, before purchasing your ticket please call our customer service to ensure that we can accommodate your pet. There will be a pet carry-on charge of $35 each way. 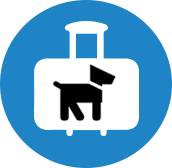 A pet traveling in cabin must be carried in a hard-sided or soft-sided kennel. The maximum dimensions for kennels are 17.5 inches long x 12 inches wide x 7.5 inches high. Charge is $40.00 for a total weight of 0-50lbs and $60.00 for a total weight of 51-60lbs. Pineapple Air assumes no liability for the health or well-being of carry-on pets. 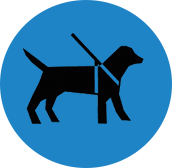 A service animal may accompany a qualified individual with a disability. If the animal obstructs an aisle or emergency exit, the passenger will be asked to move, with the animal, to a seat location where the animal can be accommodated. If this is not acceptable, the animal travelling may need to be checked in as cargo. Service Animals must be able to fit under the seat in front of you and remain in a carrier for the duration of the flight. Service Animals are limited to one animal in cabin per flight.